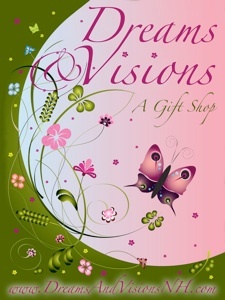 Dreams & Visions Gift Shop was first opened in 1997 with Wendi and Mike overseeing the day to day issues, and lots of guidance from Wendi’s parents, Debbie and Moe. We are located in the Town Square of Waterville Valley, NH, the first shop to the left of the main entrance. Our goal is to provide a wide variety of unique and high quality gifts and home accents at reasonable prices. glass, Yankee Candles, and Burt’s Bees products. Other products we carry may not be as well known, but are made with the same quality and attention to detail. Since Waterville Valley is a ski resort in northern New England, we do carry a large assortment of winter sports related items, as well as plenty of moose and bear merchandise. We will show some of our favorites on this website. Please feel free to drop us an email or give a call about anything we mention here, or anything you saw while visiting our shop. We will gladly fill any orders.